As you might imagine, Betsy and I have been surprised by a lot of things throughout her first pregnancy. I’m sure she has been surprised by more things than me… by a lot. Everything from eating challenges to photography fights has been discussed at length. Of course, this is all part of the first time parent process and we couldn’t be more excited to bicker about this little stuff. We know that none of it will really matter once the baby comes. But one thing we definitely were not ready for was the baby shower. 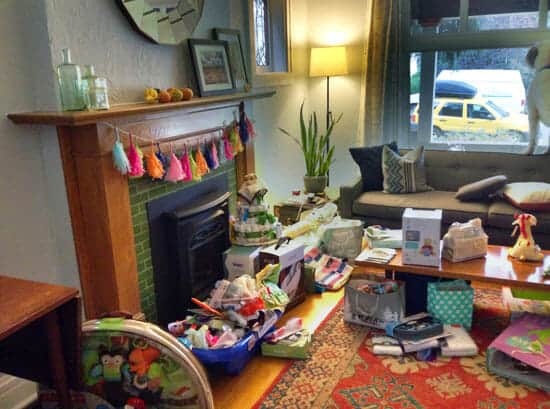 It turns out not having a baby shower can be a bit contentious. Betsy started by thinking she definitely didn’t want one, but once that notion got around to her family, they shifted into high gear, bought plane tickets, and took time out of their lives to fly to Denver and throw one! I forget what came first in the baby shower theme: The name “Fetus Fiesta” or the giant uterus pinata that arrived on our doorstep. I did not know about the uterus pinata before I opened the box. After consulting an old high school biology textbook, I realized what I was looking at. What does one put in a uterus pinata? That’s the age old question. Betsy went with candy (always a hit), but I was pushing hard for 144 mini plastic babies because that exists. None of this terribly concerned me though. My job was to make the food and leave as quickly as possible. If you know anything about my wife, you probably know that she loves Tex-Mex. The Macheesmo Tex-Mex section is essentially an ode to Betsy. Not everything was Tex-Mex though. 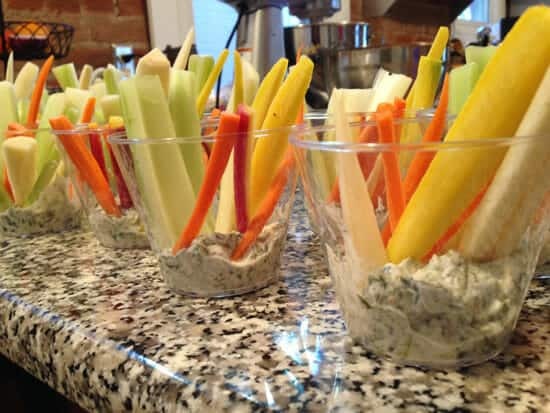 I also mixed up a quick batch of spinach dip and served it in little cups with lots of crunchy veggies. This was kind of a quick appetizer that I imagined people could walk around and snack on. It was actually Betsy’s idea. I think they came out great! (You can use any spinach dip recipe for it). Betsy also wanted to keep it relatively light so we decided to skewer up some fruit kabobs. 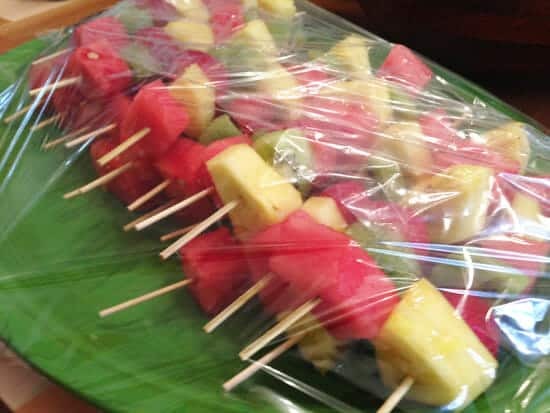 Watermelon, pineapple, strawberries, and kiwi on skewers. Easy stuff! For the real heart of the meal, I made two savory things. First, I made a big batch of homemade taquitos with bean and cheese filling. Also, kind of hard to see in this picture, but I made a few drinks including a huge thing of sangria, fresh lemonade, and a huge thing of spa water (ice water with cucumbers). For dessert, I made two dozen churro cupcakes which were possibly the hit of the party. Once I had all the food ready, I said hello to a few friends and then hit the road to go hang out with a few dudes and drink beers. Meanwhile, the pinata got whacked. Betsy said this was good practice for her birth plan (AKA Get the baby out of the uterus and that is all). 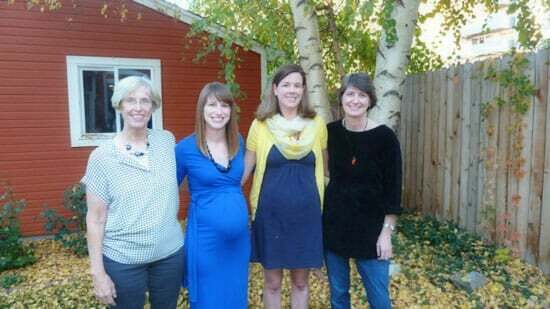 Betsy’s Mom, sister, and sister-in-law came into town to help organize and everything. It was great to see them all and really meant a lot to us that they came all the way out to Denver just to help with this. Oh… and if you’re wondering, our little nugget will have lots of play buddies. 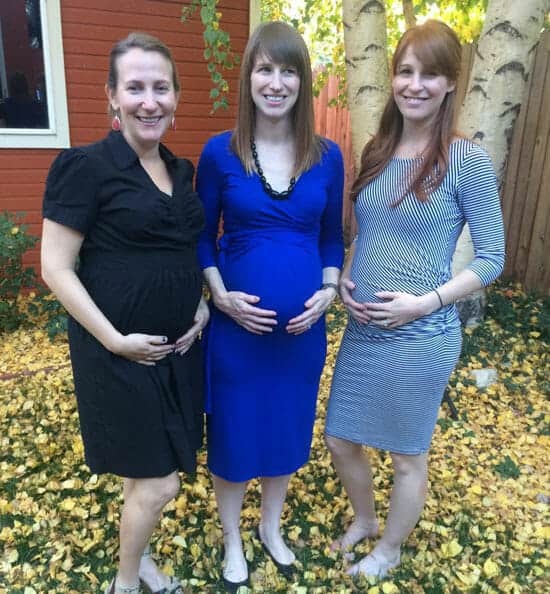 So many of our friends have had babies in the last few months or are well on their way as evidenced by this picture. I came home after a few hours to a scene out of a Babies-R-Us catalog. So many things for one baby. We now have all of the things. My step mom brought us an entire diaper cake (a real thing) and also an baby bath full of goods. We are still going through it all! People were so generous it kind of blew me away. What I came home to. It’s possible that people (mostly, maybe, our mothers) were a bit peeved that we aren’t finding out the gender because they would’ve loved to buy pink dresses or whatever. Everybody’s money is on boy anyway. PS. 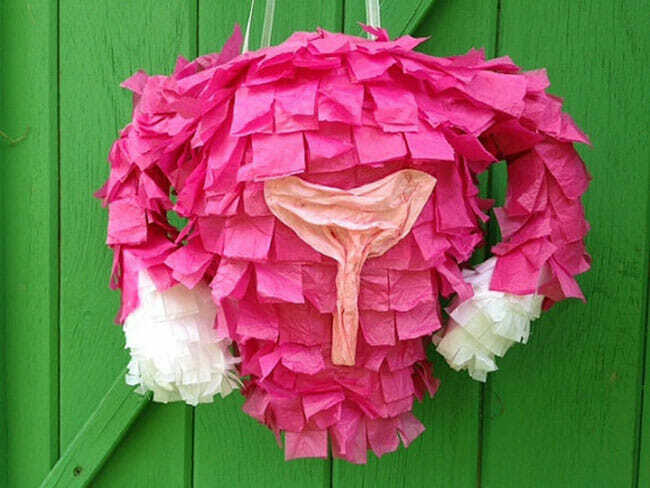 If you want your very own uterus pinata for who-knows-what, here ya go! First, TMI on the piñata, although I did like the plastic baby idea. You did a great job with the catering. People looooooove babies and your baby will be a star no matter where you go. Glad the party was a hit! 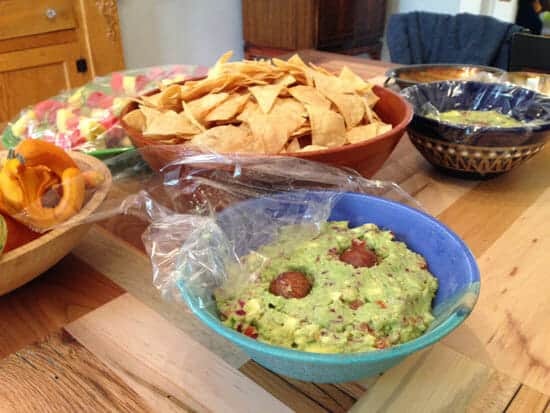 The food look great, especially the taco bar. 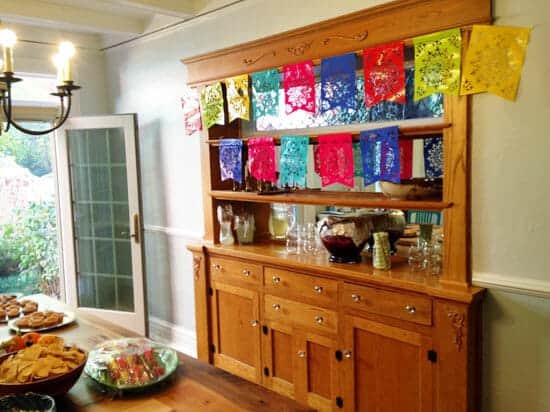 I found the pinata funny–to live life sometimes you need a good sense of humor! Loved the pictures! Loved the recipes! Thank you for sharing such a wonderful sense of family unity, continuity and hope for the future. Thanks Jeanne! We are pretty lucky over here. Thanks for reading! 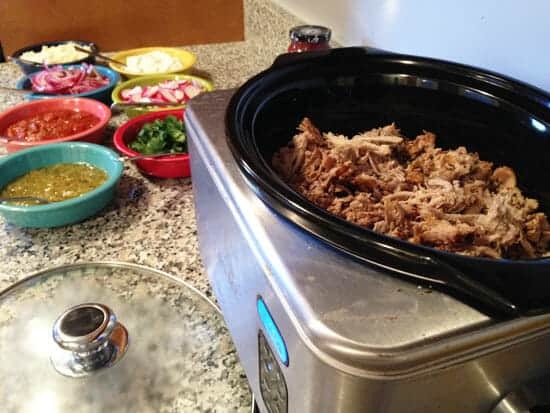 So sad I missed out- looks like it was a good spread. You know I would’ve dominated that uterus pinata too. Can’t wait to meet that lil nugget! Oh my what a special day, for both of you!! You are so blessed to have such loving family! What a FUN party! The uterus pinata made me laugh out loud. I’ve never heard of that before. Too funny! So happy for you all – can’t wait to see the little nugget soon! It really is soon isn’t it! Yikes! 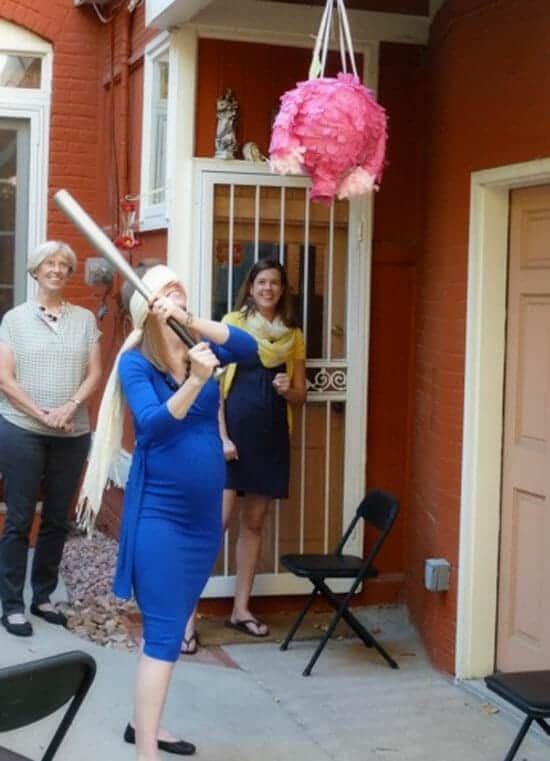 I, too, had never heard of a uterus pinata– very creative, in a weird sort of way! I loved the spinach dip in cups w/ veggies– makes it so much easier to eat, and I will be putting this on my next appetizer menu, for sure! Congrats on your continued journey! OMG. That pinata is so disturbingly awesome. I can’t decide if the uterus pinata is awesome or creepy….or both! When does the “fetus” finally become a baby? Having a baby will not only change your life, but you will experience a different kind of love that is beautiful and unconditional! Here is to a healthy baby and minimal pain delivery. Adorable! You know what you need for a baby? A place for the baby to place its’ head and sleep. That’s about it. I have 8 children (2 sets of triplets and one set of twins, yes each birth was a shock to us as well!). They require only what you can give them. Good luck. Best wishes for a blessed birth. Y’all look like you have an amazing support system in place. God bless. Thanks Kay! We definitely are feeling very lucky, but 8! Wow. Sounds like you have a great outlook on it though. Thanks for reading and the comment!